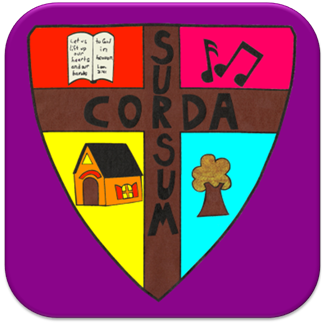 Great News for Those with Family Overseas | Lift Up Your Hearts! 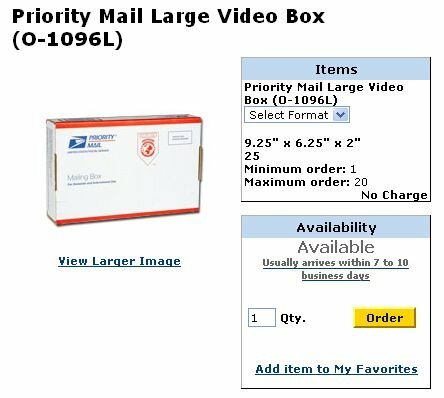 The Priority Mail Large Video Box (O-1096L) may be the U.S. Postal Service's best kept secret. It's not a very big box (9.25" x 6.25" x 2"), but it holds quite a bit more than the Small Flat-Rate Box, and if you're shipping internationally—or at least to Switzerland; I haven't had need to try any other countries recently—it's the same price. You can get the boxes for free from the USPS, too. The trick is knowing what to order. 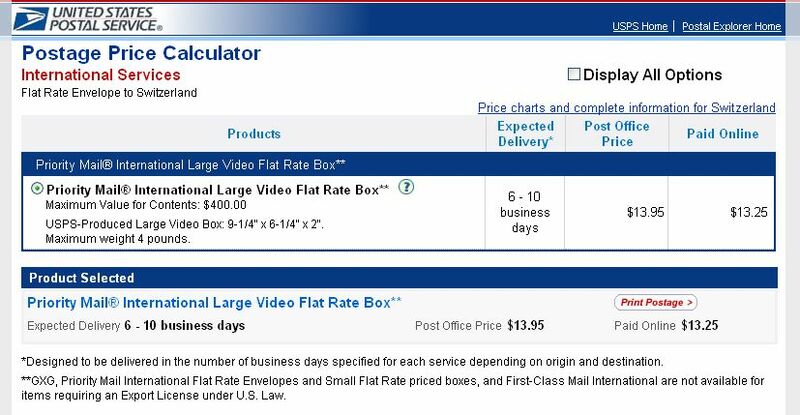 The box is O-1096L, called "Priority Mail Large Video Box." You see, it's not flat rate domesticaly, only internationally. But the kind USPS lady on the phone—whom I called in desperation, being unable to find a "flat rate" version among their shipping supplies— assured me that this is the right box to use, though she admitted that some local post offices haven't gotten the word yet that it's flat rate for international shipments. I've used it successfully twice so far. UPDATE: Apparently most post offices don't carry these boxes. You can get them free from USPS online, but it does take time. UPDATE 2: I forgot to mention that in order to get the $13.25 price you must pay for the postage online and print it yourself; if you pay at the post office, the price is $13.95. We've found it well worthwhile to set up the ability to pay online, as the price is almost always better. UPDATE 3: Did I mention that this is the Postal Services best-kept secret? Unfortunately, they're also keeping it from many of their employees. One person I know went to two different post offices, only to be told each time that the postage cost for her package would be over $30, because the box doesn't say "Flat Rate." What's more, they refused to call, or look it up online, although one branch said they'd look at a printout if she brought one. Later, when she herself called the main USPS customer service, the representative confirmed the flat rate (after sighing, "Oh, the Video Box problem again"), but added, "Good luck convincing a local post office if they don't believe it. It's at their discretion whether to accept it or not." WHAT??? The local post office can decide, willy-nilly, what to charge for the U.S. mail? This is carrying privatization a bit too far, don't you think? Actually, I don't believe it. She's going to try a third, larger, post office (after calling ahead, and bringing printouts with her just in case). I think the wonderful folks at our own local post office deserve a large plate of Christmas cookies this year: they're always friendly, always helpful, and they've never given me any trouble.with the Large Video International Flat Rate Box! UPDATE 4: I half take back my harsh words in Update 3. The post office that said they'd consider changing their minds if they saw proof apparently decided to look it up themselves, and today gave almost no trouble: The first clerk refused, but the one next to him overheard and said, "No, no, it's okay, she's right. We looked it up." It would have been nicer if they'd been willing to look it up the first time, but at least they're all educated now. UPDATE 5: As you can see by the comments below, people are still having trouble with this, depending which post office they use. As I said, "Educating the world, one post office at a time." The bad news is that, since the recent postal rate increase, the cost of the flat-rate box has risen considerably. It is now $16.95, with no discount for paying online. :( But it's still better than First Class (currently the least expensive international option (at least to Switzerland, and I'm assuming to most countries) if your package weighs more than 1 pound 12 ounces. UPDATE 6: (12/14/13) Well, it once was a great deal. Now it's $23.95. Unfortunately, I still have to call that a reasonably good deal—compared with other overseas rates. The demise of international book rate, and then international parcel post ("boat rate") has been a sore trial for those with family overseas. UPDATE 7: (3/14/16) I don't mind occasionally paying more in postage than the value of the item sent. Otherwise I'd never send homemade cookies, or Hallowe'en candy surprises. But the cost of this box, which is still in most cases the least expensive option, is has now risen to $33.95! Note the update above. So far, no one I've asked has been able to get the boxes at a local post office, only online. I've added another update. "Best kept secret," indeed! Once a week I delete all the comments caught by our spam filter. The volume has become so great that I was about to resort to clicking the "Purge Spam" button instead of checking out each post individually. After all, I've been using this system for years and it hasn't yet made a mistake. Well, not until now, anyway. IrishOboe's latest comment was hiding there, amongst the ads for loans, fake passports, and fancy leather goods. No idea why. I don't think I accidentally marked it as spam during moderation, but neither can I think of a reason for the otherwise great spam filter to have tagged it. So I guess I'll continue my more labor-intensive deletion process a bit longer. See Update 4 above. Educating the world, one post office at a time. Sorry about that. It was too short and sweet, maybe? I had a horrendous experience at the local post office involving this box. I ordered the boxes online and the USPS delivered them in just a couple of days. But when I tried to ship something using the box at the local post office, nobody there believed that it's a flat-rate box. They refused to look up the info in the manual, even after I showed them reprints of the usps web pages. They insisted the USPS made a mistake shipping me that box. I was quite angry when they said the only way to ship it at flat rate internationally was to wrap the stuff in bubble wrap and put it in a flat-rate envelope (but that wouldn't work for my purpose). The argument became heated and eventually they threatened to call the police so I would leave! That was so incredible. I drove to another post office and the clerk there had no trouble understanding me and let me ship in the large video box at flat rate. No hassles at all! Well, I don't think it's worth getting arrested for, but I can understand the frustration. The postal service either needs to educate their employees, or print the boxes with "international flat rate" on them. I am having trouble finding this size box. Neither of the two post offices I have gone to have them. That seems to be typical. Everyone I know has had to order them from USPS online. They're free, and only take a few days to arrive. Our post office said that they've tried to get them from their own suppliers, and can't. It is so weird. When you buy online (see link above), you'll note that it doesn't actually say "flat rate." And if you look under the flat-rate boxes you won't find it. The only reason I knew about it was that when I did a "calculate postage" it was one of the suggestions. The last time I shipped this box, the table listing the shipipng options listed this as "unavailable" but I was still able to click the radio button and the postage label printed just fine. It was a couple of dollars higher, but I assume that is because of the rate changes from January. And I can report that the package arrived just fine and was happily received. What a sweet note, too. Argh! I had the same problem trying to ship today as reported above. I had ordered the boxes on-line, but they arrived without the words "Flat Rate" on them, so they wanted over $40 to ship it! I told them I would try a different post office. I tend to get very flustered in these situations (even though I knew this was a possibility). I will try a different post office, but have the print-out with me. The funny thing was, I could see the screen where the employee could choose the different options and the $16.95 price was listed. Argh! indeed. The boxes aren't labelled "Flat Rate" because, domestically, they aren't. It's only internationally. But why they don't say that on the box, I don't know. My personal guess is that they're trying to use up old stock before printing new ones. I think it would be better, and more effective, to make the boxes available at the local post office -- if people could actually see them, they might use them, even domestically. Getting flustered is better than getting arrested. But do not -- repeat, DO NOT -- pay $40 to ship this box. It's beginning to feel like a scam, but I know the flat rate is good. Even though it's no longer as good as it was last year (see update above). I hope your second post office is more reasonable. I went back to the same post office with my little piece of paper in hand. I had printed off the description and picture of the box that clearly showed that even thought it is called a flat rate box it does not say "Flat Rate" on it. They were unmoved. She even came out and showed me other boxes on the rack that said flat rate on them. I explained that this is what they sent when I ordered the flat rate box. I asked if they could order me the flat rate box since I seemed to be unable to do it properly from home. She then proceeded to show me what was available for international boxes. She turned her monitor around so I could see, and what do you know, there it was. For $16.95! She apologized and said they all learned something. She was even surprised at the customs form she had to use (they had me fill out a large one in the morning, but this afternoon it was the little green one). Anyway, it has been shipped! I know this is a bit late since the last post, but I as well had encountered this problem. Ordered the items from the USPS site and went down to the local post office, where I was told that the only one package that wouldnt print online (czechia) that it would be $48. I tried to explain the $16.95 cost, but was thwarted by the box not having the "Flat Rate" printed on it. Went to the main post office, because they are smarter "most" of the time, only to be turned down again. My postage that I printed online expires at midnight so I had to repackage the parcels right there on the floor in the post office. For tomorrow though i have printouts from the website and manuals that show the discrepancy with the international vs domestic. I sure hope it worked out for you today, Michael. I wonder when the USPS will give up and just make boxes with "international flat rate" printed on them. I'm beginning to think that would be easier than educating all the post office branches. But I hope they don't give up altogether—this flat rate box is such a blessing for those of us with overseas family. It would be even better if they'd bring back international media rate as well. I had the same kind of experience today -- "you can't ship this flat rate, the box doesn't have 'flat rate' printed on it." No luck until I went back to my office and printed a couple pages from the USPS postage calculator. When I went back the agent looked at my printouts and went off to investigate. Ultimately I was able to ship my box. 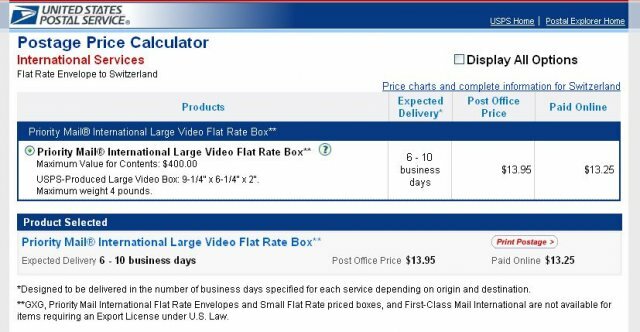 I do think it would be easier for all concerned for the USPS to print this size box with "International Flat Rate" right on it.